Is this what Windows XP's death throes look like? It's the first of the month (US time), so off we go to Netmarketshare and Statcounter to see what operating systems are getting a run on the world's desktop computers. Our long series of stories on the two analysts' output has shown, time and again, that Windows XP is just-about-unkillable. Despite Microsoft ceasing support, the venerable operating system has continued to gain market share, and hold on to a stubbornly high market share. Don't speak it too loudly, but this month XP might just have taken a decisive dip. Netmarketshare has it dropping from February’s 19.15 per cent to just 16.94 per cent. That's the third-deepest monthly dip since we started tracking this stuff in late 2013. StatCounter's also found a decline, from 12.23 per cent to 11.12 per cent. Again, the dip's sharper than most since the OS levelled off late last year. The two surveys vary on the fortunes of Windows 7 and 8.1. 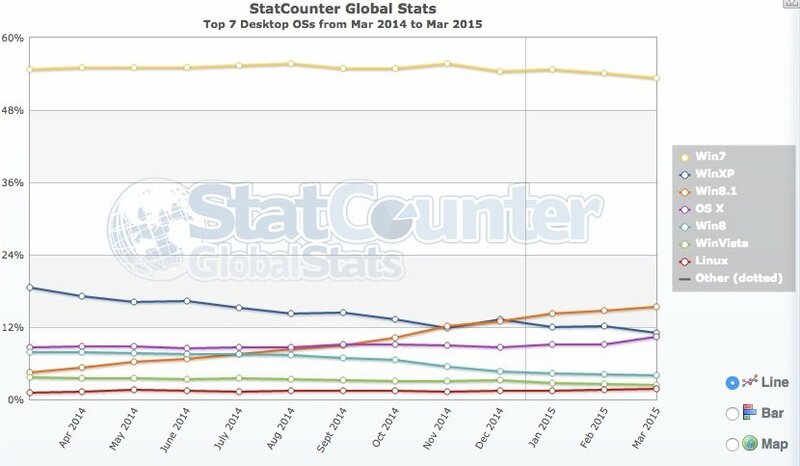 StatCounter has Windows 7 down 0.83 per cent to 53.3 per cent of the market and Windows 8.1 up a point and a half to 15.39 per cent. Netmarketshare has it up 2.06 points to an all-time high market share of 58.04 per cent. Let's get graphical: here's Netmarketshare's look at desktop trends.